When I was a little girl, going to the shopping mall was fun. 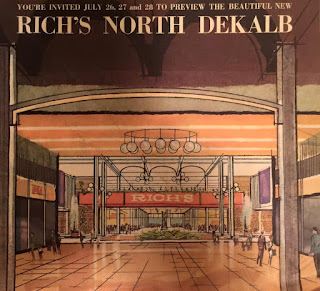 My favorite was North DeKalb Mall in Atlanta (Decatur area). This mall was built in 1965, and it was enclosed. It was a smaller mall, with all the shops on one level. 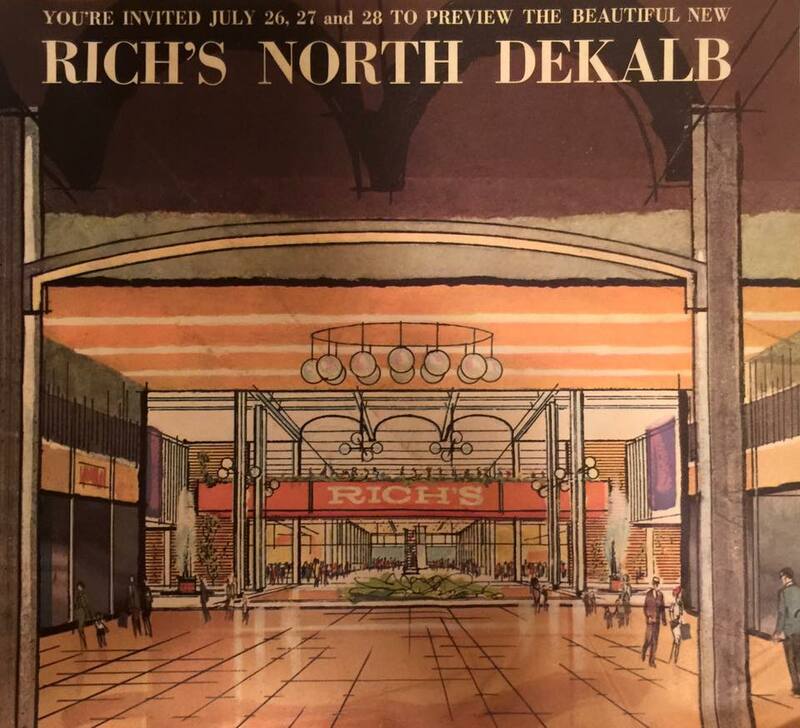 North Dekalb featured a Rich's department store, a wonderful Woolworth dime store, and other fun, like a Dipper Dan ice cream parlor and a Milton Bradley toy store. Rich's was special. This Atlanta department store chain was a beloved institution. (See my earlier blog post about Rich's here: Return to Rich's, an exhibit at the Breman Museum. 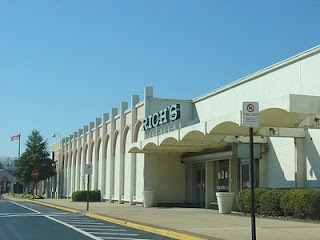 I fondly remember shopping at Rich's, North DeKalb Mall for school clothes, Easter dresses, party dresses, books, and records. (My first record album came from this store.) There was a tea room upstairs, and I went to a few fashion shows with my Mom there. I remember buying "Buffy dresses" (marketed to look like the clothes worn by Anissa Jones as "Buffy" on the 1960's television show Family Affair) after one of the fashion shows that featured children's clothes. There was also a snack bar, and an amazing bakery (coconut cake, cupcakes, and more). In high school I worked part-time in the Juniors Department, which I loved (cute clothes!). Later, in college, I worked part-time one Christmas in housewares, which I also loved (I love kitchen gadgets and cookware). Through the 1980's, this mall was still thriving, with a food court, a movie theater, and shops like The Gap, Old Navy, Hallmark, Casual Corner, The Limited, a bookstore, a music store, etc. At some point, Woolworth closed. Then Rich's was bought by Federated, changed to Rich's-Macy's, and eventually evolved into Macy's. It was still a nice store, and usually referred to as Rich's by people who grew up in the area. Then something happened. National chain stores started closing and being replaced by discount stores and little local shops. There was a high turnover rate for stores, and it seemed constantly in flux, with some blank spaces where shops had been. Chain restaurants at the mall started moving out. The mall changed. It was no longer what I remembered from childhood. The Macy's (former Rich's) at this mall held on. It was a small but nice store. I shopped there for linens, for birthday gifts, for Christmas ornaments. I was very surprised to read the announcement last year that this lovely little department store would close. It had been around most of my life and was such a childhood institution. Shopping malls are different now. They aren't the destination they were when I was growing up. The only thriving mall I can think of in this area is Lenox Square, an upscale mall in Buckhead (Atlanta). The others have all changed, to varying extents, with closed stores, little local businesses taking over chain boutiques, high turnover, downsized food courts. So of course, I rarely visit the mall. I shop online, I run to Target, I find other ways to shop. And I miss the old fashioned malls from my childhood and teen years. What are your shopping mall memories? Have you seen the same trajectory with shopping malls in your area? Are there any malls that still thrive? I'd love to hear from you in the comments, below. It's scary and also good how everything changes so fast! Earlier shopping malls used to be a hangout place and something associated with higher class. But now, there's no novelty in it. It's just a fancy departmental store! New England had a number of stores called Rich's but they were more like a Walmart. My husband and I were there every Sunday to shop their sales as both of us really enjoyed going to that store. It is so interesting how things have changed. I used to LOVE going to the mall as a teenager. It was somewhere we could go without parents, haha. But with online shopping so popular now, it's just not as popular, which is too bad. I did not grow up in the US and I have only known the big mall culture, its interesting to read how things have changed and evolved in this country over the years. Haha and yes, online shopping has changed so many things, most of my shopping has moved to amazon and online sites. Thanks for stopping by. It would be interesting to hear what mall culture is like in other countries as well.